Final reflection on Brazil | Walk with us! As noted previously, Fr. Tim Gray, SCJ, spent the summer in South America, living and ministering with our SCJ communities there. This is his last blog entry from Brazil. I want to conclude my reflections on my visit to Brazil by describing a fascinating symbol which, to me, says a lot about the church in Brazil. 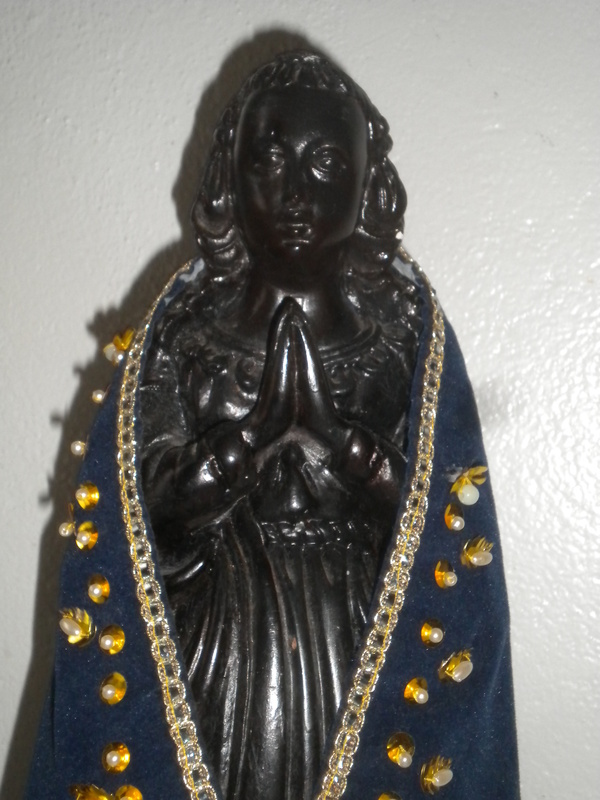 It is a statue of Mary, Nossa Senhora de Aparecida. The actual terra cotta statue is tiny — just over 12 inches tall. The statue was found in 1717, tangled in the nets of fishermen in the river Paraiba, stained dark by being submerged in the water. It was recovered in pieces — first the body, then the head. The fisherman brought it home, and soon it became an object of devotion because of the many healings which took place. A sanctuary was built, and then enlarged, as devotion spread. In 1930, Nossa Senhora de Aparecida was declared the principal patroness of Brazil and in 1955 construction began on a new sanctuary building which, according to reports, is second in size to St. Peter’s in Rome and the fourth most visited Marian shrine in the world. And in its place of honor, a 12 inch tall statue. What continues to amaze me is the hold that this tiny, dark brown image exerts over the Brazilian church. Almost everyone is familiar with the gigantic white statue of Christ the Redeemer that watches over the city of Rio de Janeiro. Most churches I visited in Brazil have large, sometimes life-sized, gleaming white statues of Our Lady of Fatima, or Our Lady of the Rosary, or so many others, gazing longingly up to heaven; but none of these were chosen to be the principal patroness of Brazil. That honor goes to this small, dark statue, staring straight ahead, as if to say: I am one of you. I did not descend from heaven, supported by clouds of angels — I was brought up from the water, stained dark from the earth. I was not even whole; I was broken and healed. This statue sums up for me the character of the Brazilian people and the Church in Brazil: multicultural, always concerned about the poor and oppressed, the little ones. As other memories and impressions from my travels fade and jumble together, this one symbol remains strong in my memory: we will not forget you, the little ones. Personal note: as I return from my travels and settle in with the formation community in Chicago, I have decided to continue writing, and I have started my personal blog at thebodaciousword.blogspot.com I hope to see you there!